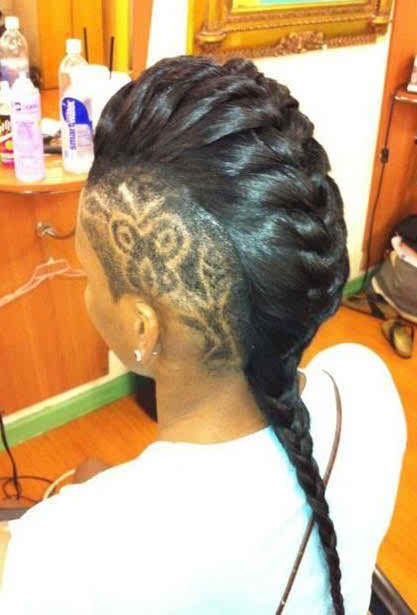 Cute Braids For Shaved Head- Shaved hairstyles make you stand out in a crowd because they are totally different from the other hairstyles and not many people have adopted this hairstyle until now. 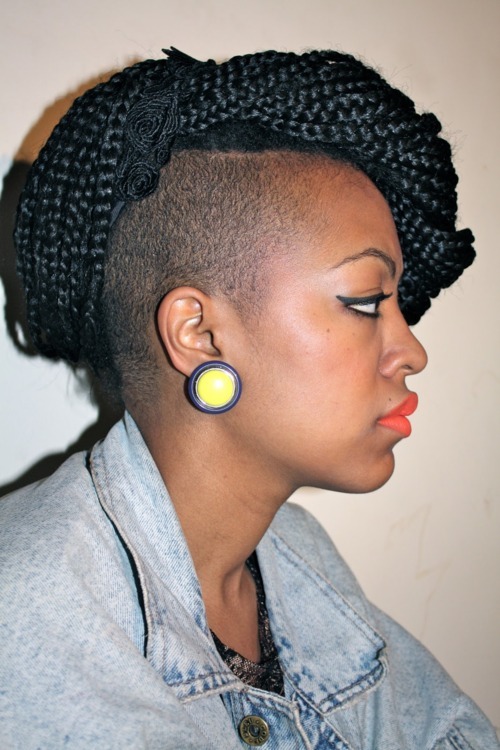 This time saving and trendy hairstyle were initially associated with punks but with the passage of time is becoming common among American and Black women too. 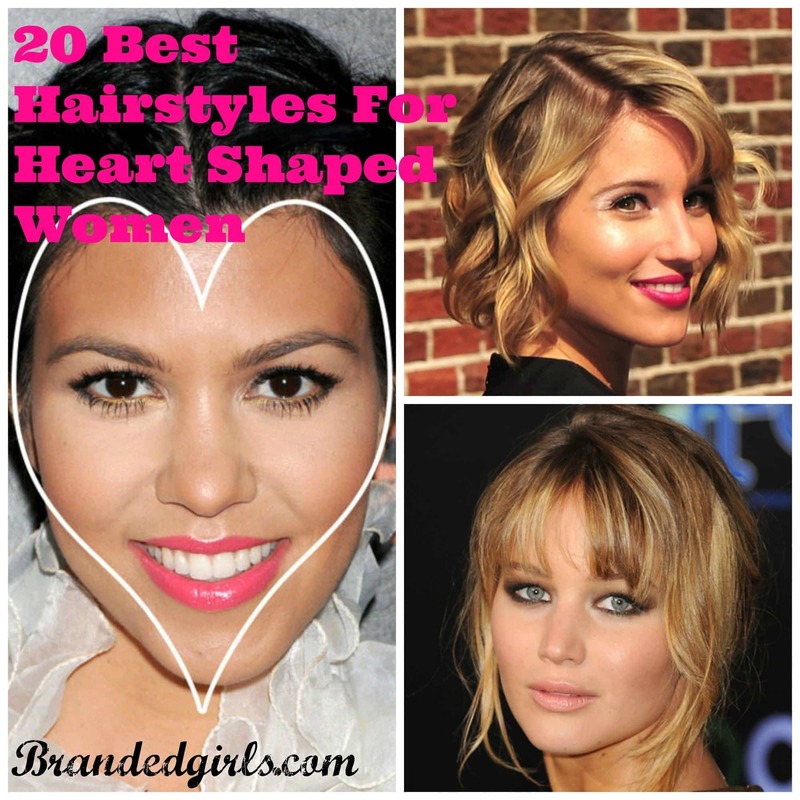 There are several ways in which you can style your shaved hairstyles. 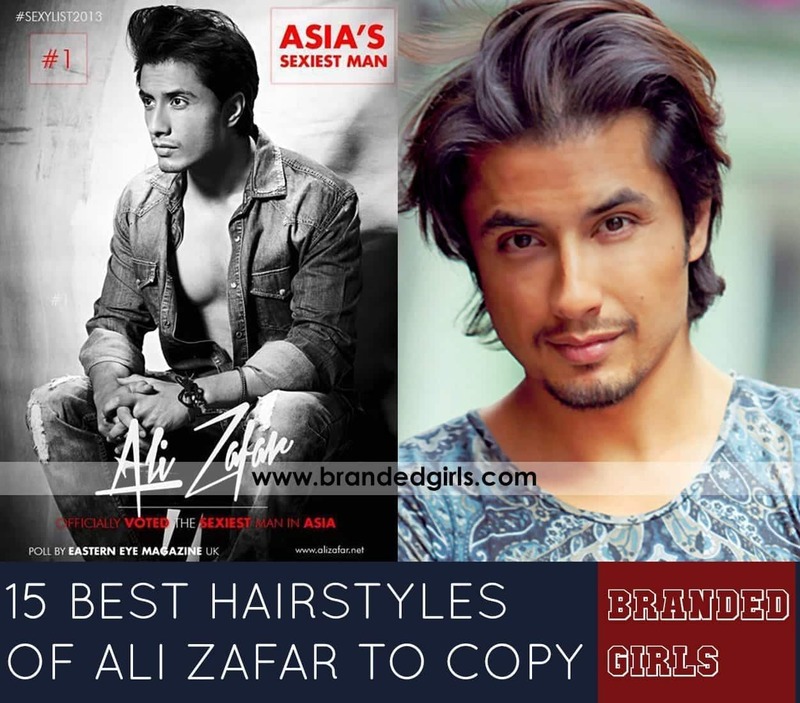 Choose the best-shaved hairstyle that suits your face type and hair texture. 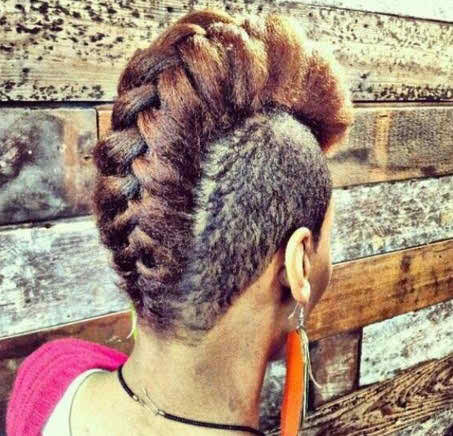 Check out some of the braided shaved hairstyles that are mentioned below in the article. 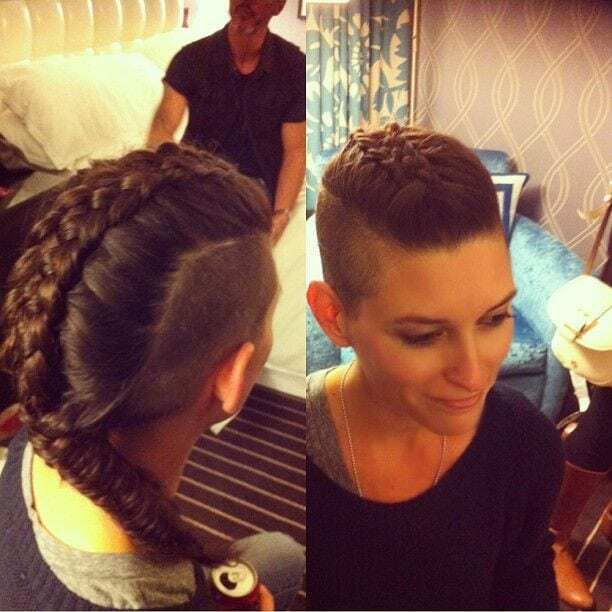 A simple braid starting from the top and making its way down with both sides of the head shaved give a very clean look. 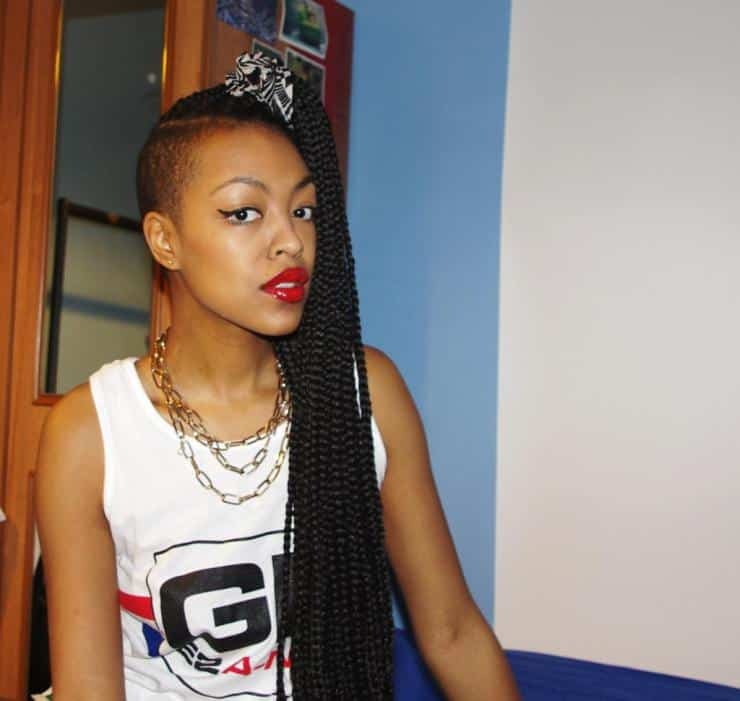 This hairstyle will make your shaved hair part more prominent and will give it a thug look. 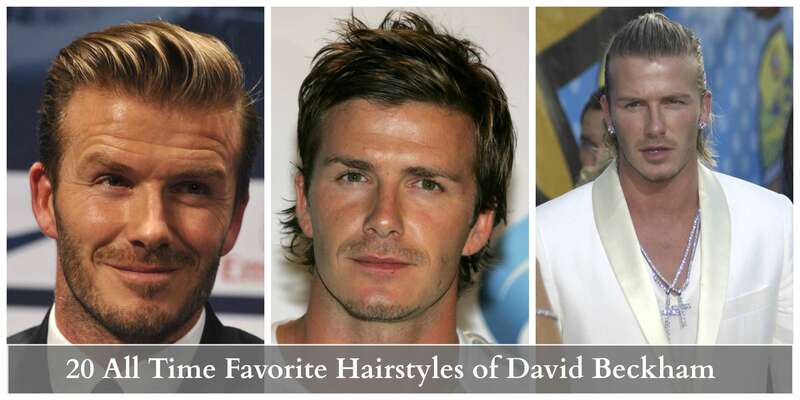 For more emphasis, you can go for french braids with a little bit of added volume by adding back-combing your hair. 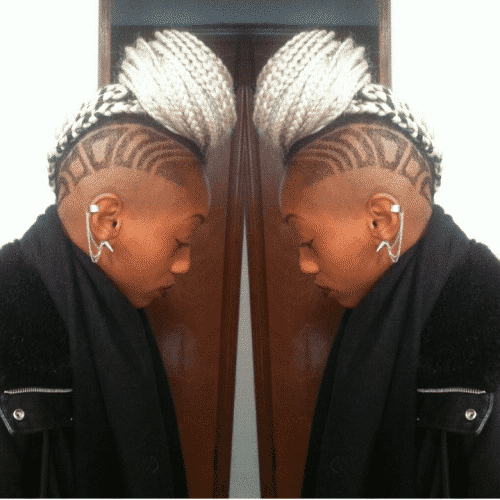 You can get you side shaved in different patterns like in the picture. 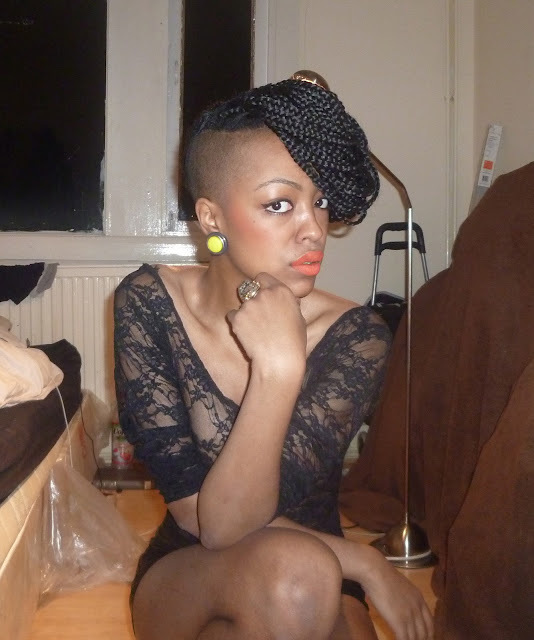 Make box braids and then tie them all up in a bun in the form of a turban at the top of your hair. 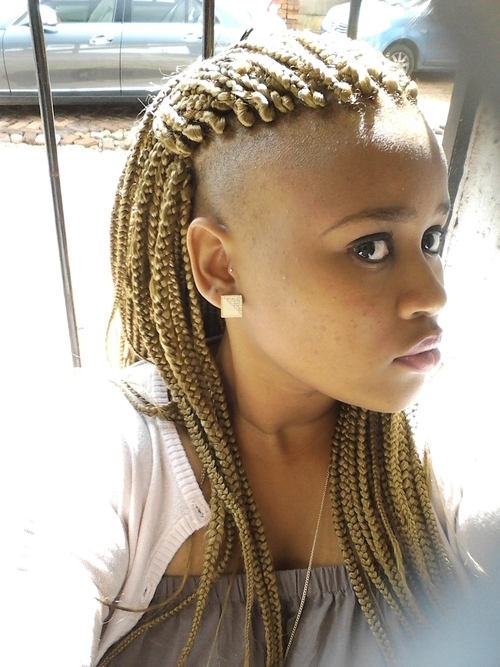 If you do not have long hair, you can also use the extension. 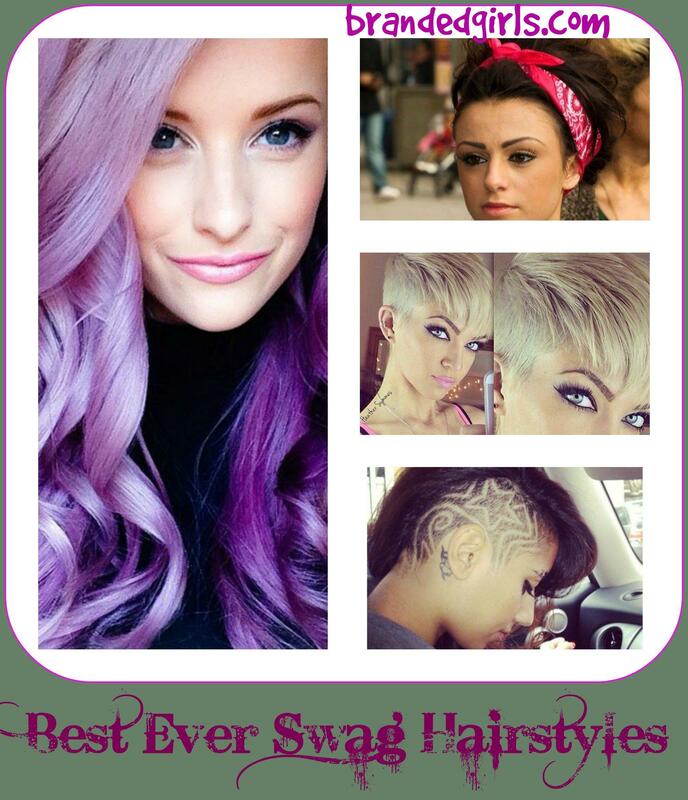 This hairstyle is a perfect street style look or if you want to look more thug then this is the right style for you. 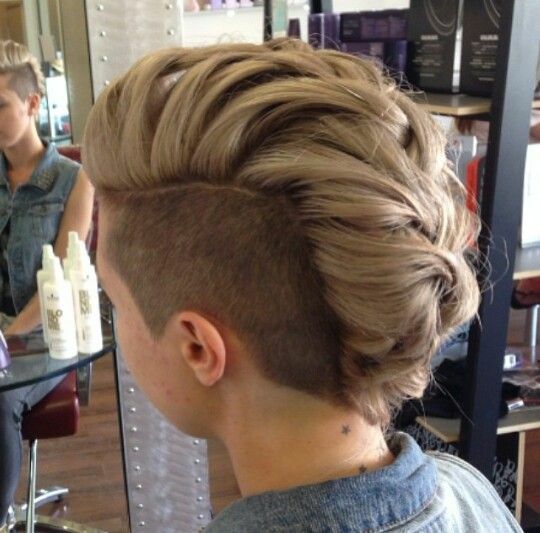 The ponytail look works really well for long hair and makes the shaved parts more prominent. 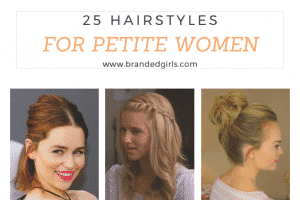 This hairstyle will look perfect on knee length maxi dresses and is perfect for any kind of occasion. 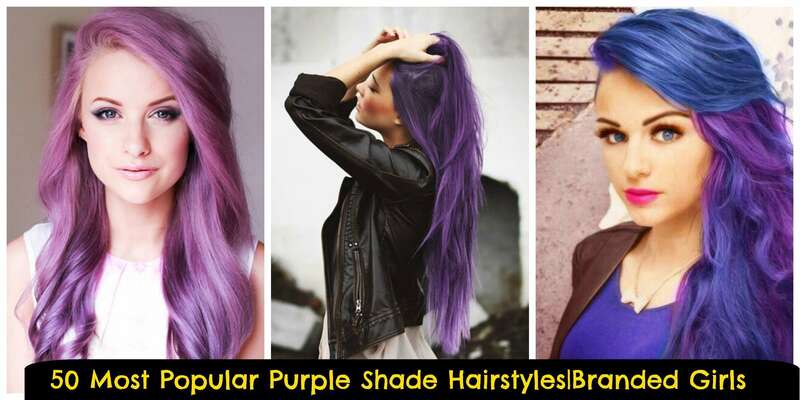 You can also color your hair to rock this hairstyle completely. The winged eyeliner used here has also created a very dramatic effect. 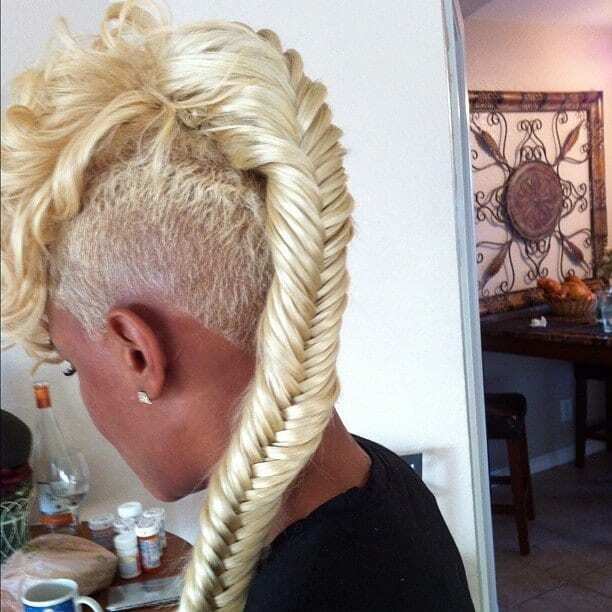 This epic and cool idea is for all those ladies out there who want to look unique at every occasion and who are ready to go for bold hairstyles. 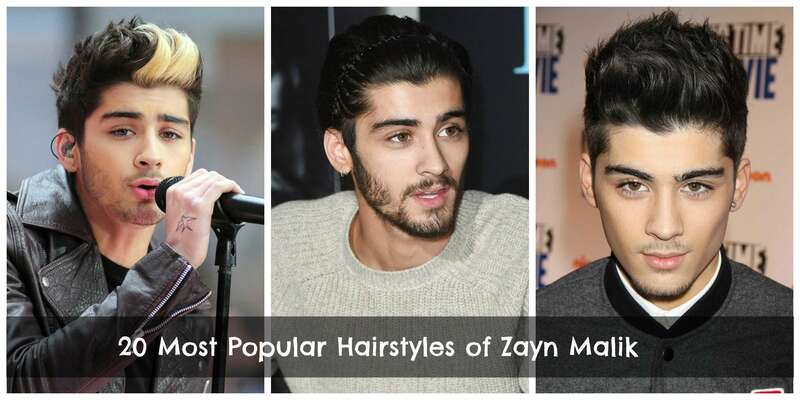 Of course, it takes a lot of guts to wear this kind of hairstyle but if you do then it will be the best hairstyle ever. 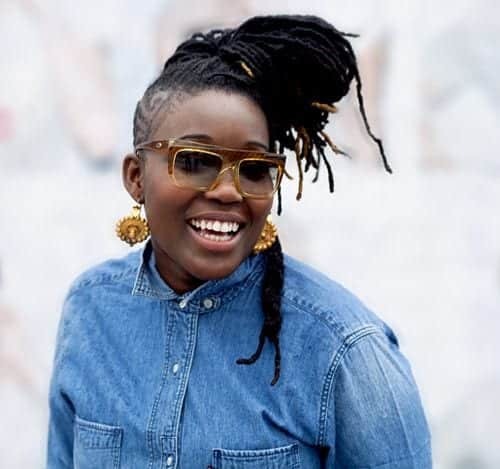 For this hairstyle, all you have to do is to go and get your half side of the head shaved and then for the rest of your hair you can go for box braids to complete the whole look. For best results, you can go for a unique dye in the shade of maroon or burgundy color for the front part of your head. 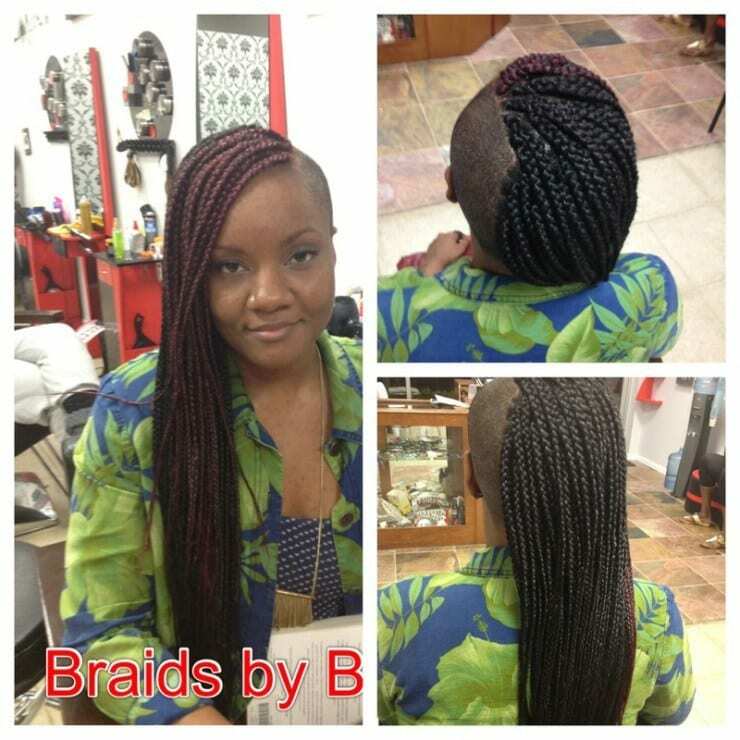 Yes, you can box braid your hair on one side and then tie them up on the top with the help of an accessory. 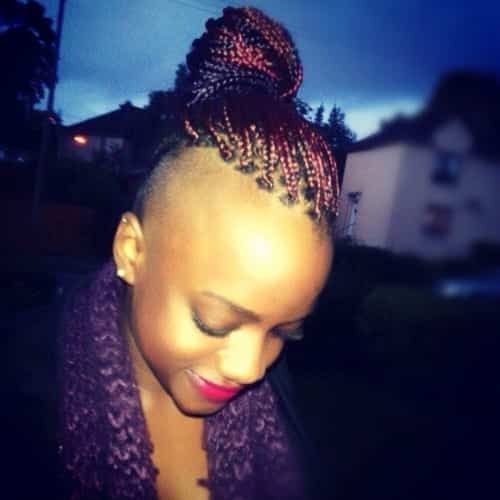 This bun idea is perfect if you want to incorporate box braid and half shaved head in your hairstyle as one. 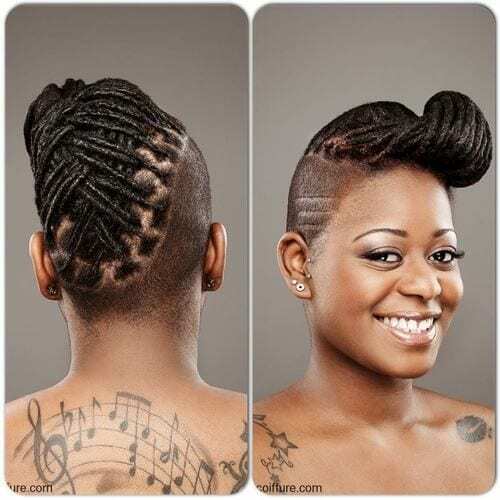 For this hairstyle, you can shave half part of your head and then make a pretty bun on the remaining hair. 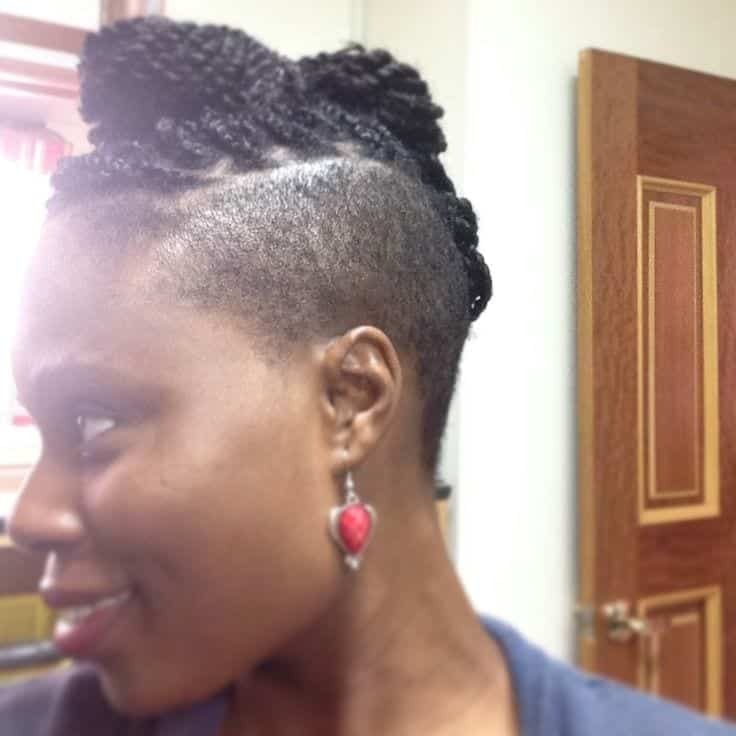 For more pimp in your hairstyle, you can first box braid your hair and then put them in a bun. Finish everything off with a nice flowery accessory to match your bun. 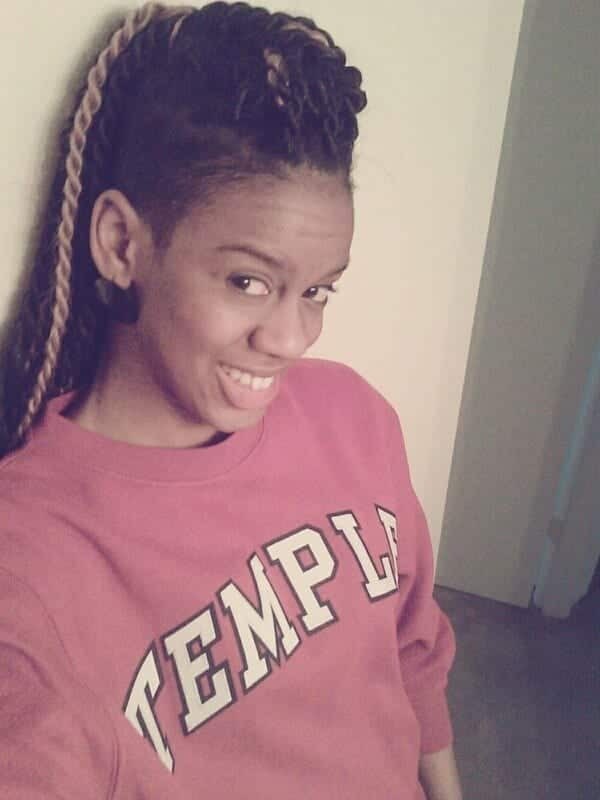 Oh and don’t forget to wear some cute little earrings with this hairstyle. 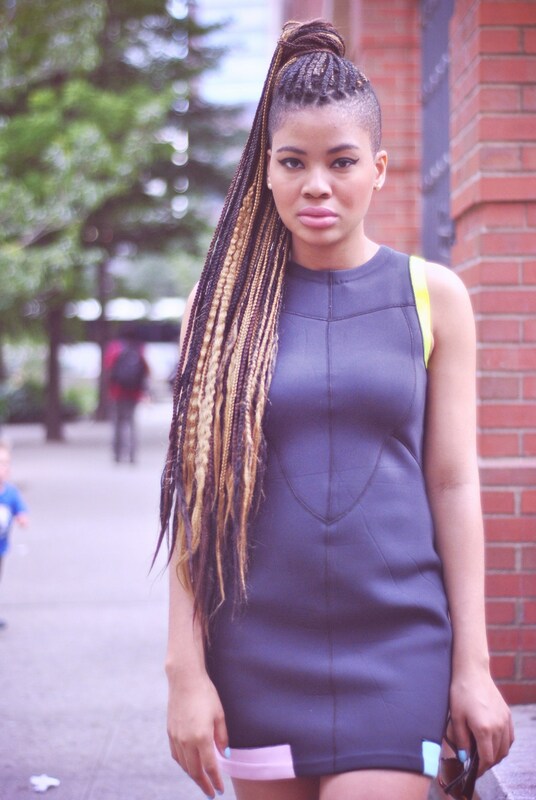 Yes, you can highlight your hair and box braid them. 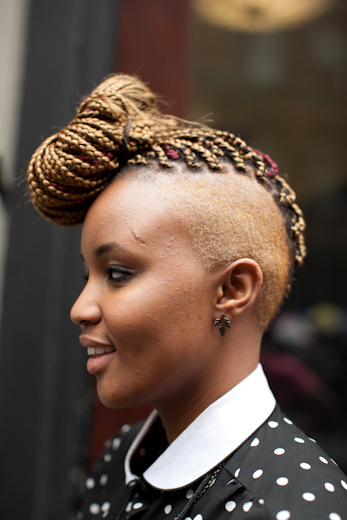 It looks totally chic when you bun them up. 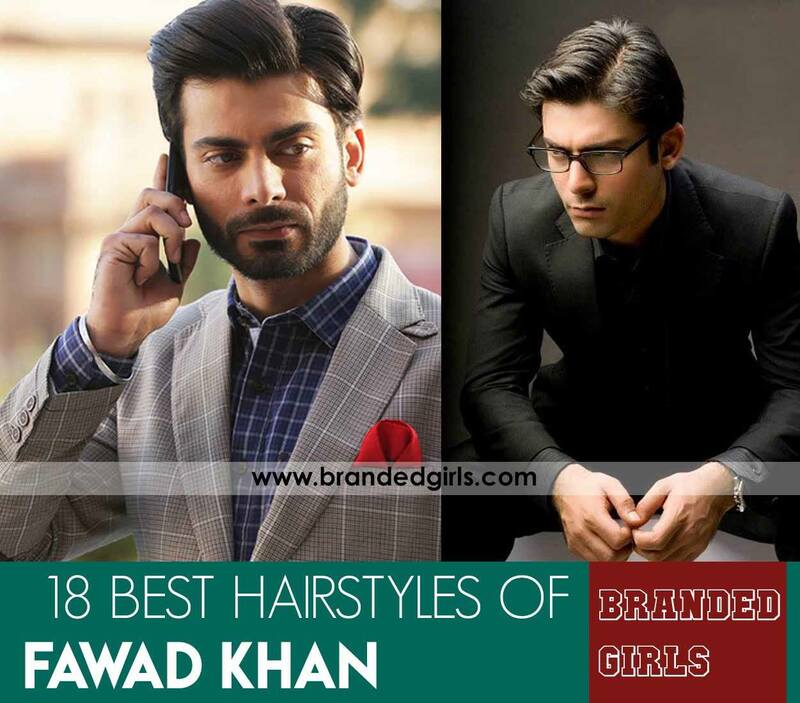 Braid your hair and tie then up as a scarf on your head as shown in the picture. 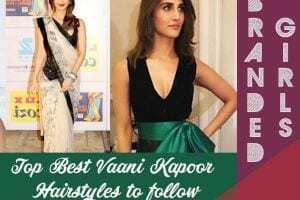 A lot of the time classic braid is too main stream and when you want a change in your hairstyle then this new braid idea is the best for you. You can call it a flick styled braid. 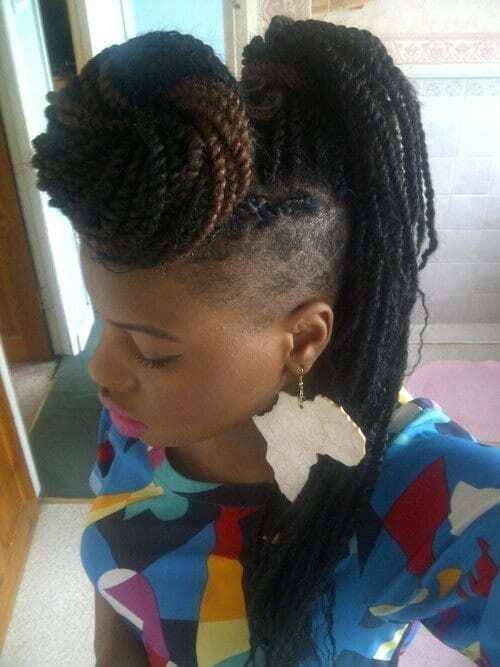 For this hairstyle, you can shave one part of your head and then make box braids on the other side of the head. You can set you braided part into a nice flick and then add a cool hair accessory. 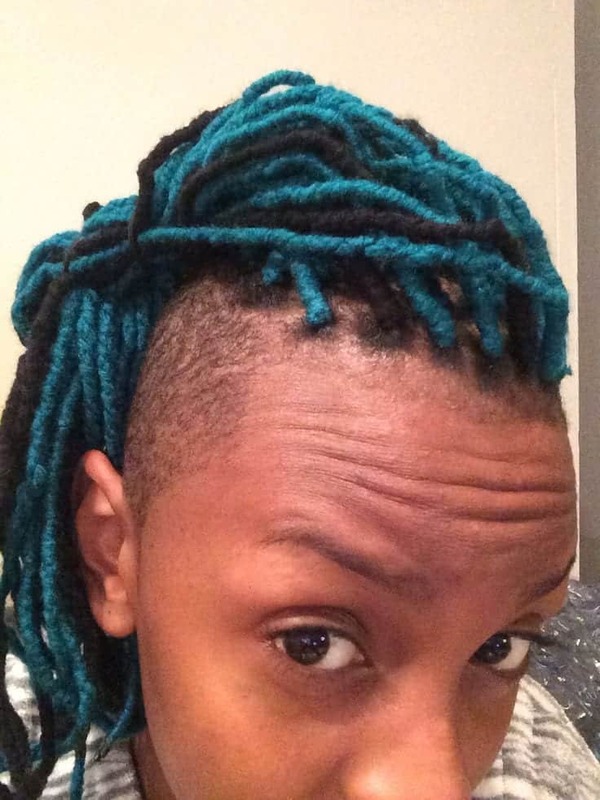 You can braid your hair from the shaved sides making a puff at the top and leaving the curls behind as shown in the pictures below. 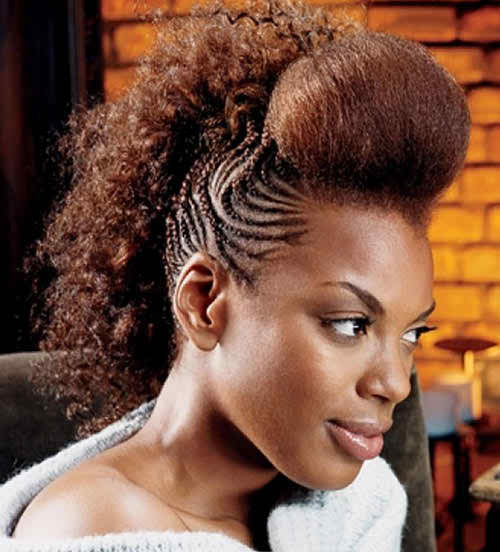 For more uniqueness, rather than going for box braid you can let your hair hang loose and then back comb the front part of your hair and make a nice puffed bun. 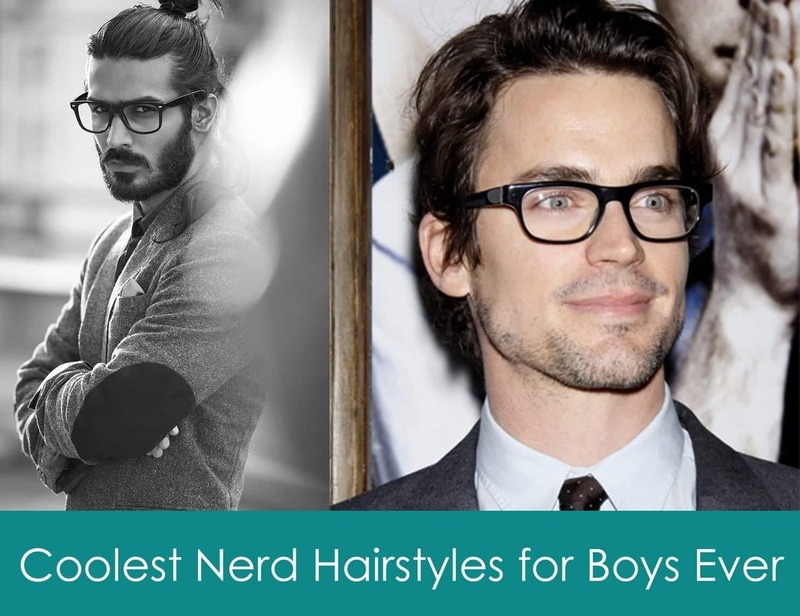 For the rest of the hair, you can add curls in them and finish everything off with hairspray. If you have hair with a lot of volume and sides are shaved then this is the perfect hairstyle for you. For some amazing outfits to go with this look, do check out Fashionable Business Attire-15 casual work outfits for women. 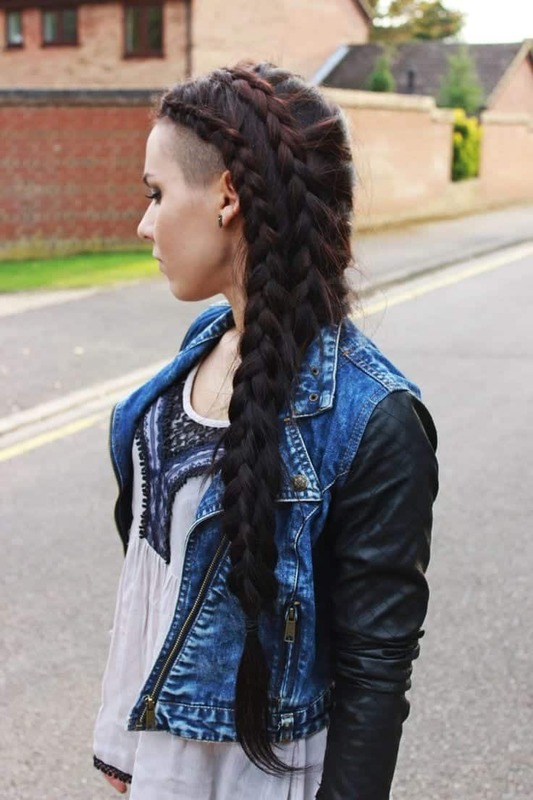 The waterfall-fishtail braid combi is another cool idea if you want to rock you shaved part of your head. 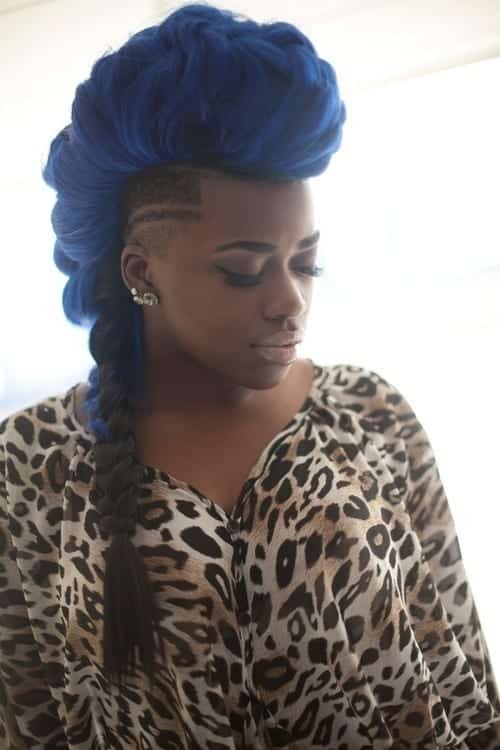 You can also add colored extensions to make the hairstyle pop even more.